Wow! Did you know that the American Academy of Pediatrics (AAP) in San Diego just released findings that 93% of parents leaving the hospital made at least one critical error when installing or using their car seat?? While this is a troubling statistic, it’s an issue that can be easily addressed by spreading the word about car seat safety and proper installation. Safety 1st wants to help! Here are some basic Car Safety Tips that you can use and share to ensure that you are not one of those with an improperly installed car seat! 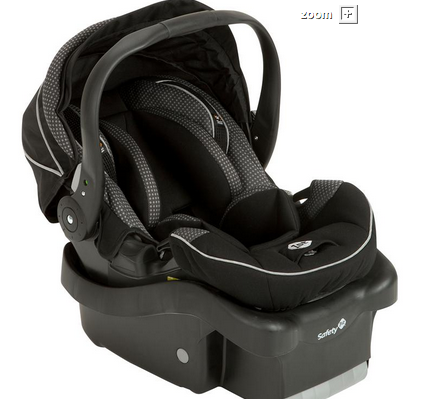 Safety 1st is offering up a Safety 1st onBoard™35 Air+ Infant Car Seat – St. Germain for one reader to WIN! Use the Rafflecopter below to enter the giveaway and please be sure to spread the word! Note: Open to US Residents only. Good luck! Yes! I make sure to check for tightness every time we get in them as well! yes. When we get ready for this baby to get here we are taking the new car seat to the fire station to be installed! I think it is! But I’m going out to check in the morning. My daughter is having her first baby in March. I’ve been reading everything I can to help her and be a better grandparent. This article is one of the best! I am a Certified Child Passenger Technician, so installing car seats is my specialty. I don’t personally have any children, but I love kids, and I love knowing that they are safe when traveling with their parents. It is my job to ensure that parents who have any questions or need any help with their kids’ car seats gets the help that they need. I am always in needs of seats to practice with and do demos with, though. Have to make sure we do this correctly!!! Great info! I have a friend who is due with her first in Jan 2015 would love t give this to her as a Baby Shower gift! Yes – I believe it is. Mine are! I take extra care to read the manual for both the car seat and for the car to make sure everything is installed properly. at this time we are using only boosters. New baby on the way and need a new infant seat. Yes our carseat is installed properly. I’ve checked and it’s in there properly! Good info for all parents to have! Always want to put safety first! i have two boys in carseats and they are both properly installed. Our car seat is properly installed. Yes my carseat is properly installed. I’m a bit car seat obsessed, so yes. I had our car seat properly checked by our local childrens hospital. They were having a car seat clinic check. i don’t presently have one in my car. We are looking to get one for our grandson which was born 2 weeks ago. The one in my daughters car is installed properly. The hospital made sure to check it before they allowed him to go home. Yes, my sons is installed properly! Thank you for this article!! I am actually in the hospital right now, awaiting the arrival of my baby boy. I’ve been following you, watching baby Oliver grow, and thrive. Your story has been giving me inspiration, because my baby is probably going to come early. I’m on complete bed rest at the hospital until my baby comes, and I just made it to 30 weeks. Therefore, I already feel blessed to have made it that far, considering what you and Oliver are going through. The hospital is 2 hours away from my house, so I feel really lonely up here away from my husband, my daughter, my family, my job, etc. It’s been a rough pregnancy, and he is going to be my little miracle baby. When we leave the hospital, I want to make sure he is in a trusted, safe carseat. I would totally feel 100% confident if he was to ride the long trip home in a Safety 1st Onboard air infant seat. I can’t tell you how much this would mean to me. I am hoping and praying for Oliver, and for my little miracle as well. Thanks for the chance! I 4got to mention that I don’t have a carseat in my vehicle right now, however I will be sure to follow all the helpful instructions you provided. thanks!!! good luck 2 everyone!! I’m such a car seat freak! My sons straps always have been and always will be at the proper height and they are tight enough that you can’t pinch it. He is also backward still and is still comfortable at 35″ 26.5 lbs and 21 months old! Would love this seat for my next one!